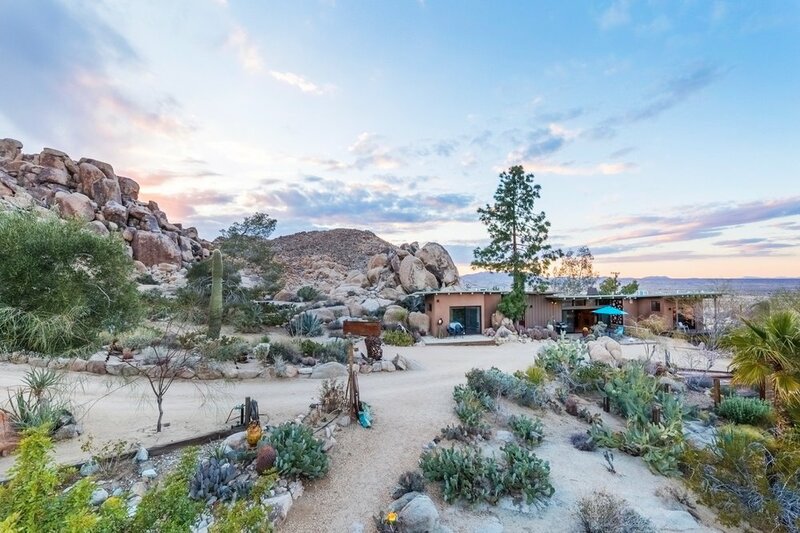 In addition to offering pre-designed new homes, Homestead Modern also offers home renovation of all sizes for those who purchase an existing home in the High Desert and want to renovate it with eye toward short-term vacation rental operations. We have access to the best contractors, building trade sub-contractors, architects and drafting people, interior designers, surveyors, pool builders and others in the High Desert. We recommend that you call us before you move ahead with the purchase of a home. We are happy to meet you at the target property so we can put together an itemized proposal for renovating it. A propane (or natural gas if available) barbecue is a necessity at any vacation rental (we never recommend charcoal briquet barbecues). Propane barbecues can be as simple as a free-standing unit you purchase yourself or a more elaborate, built-in one we can design and install for you. We prefer to connect all barbecues to the larger (200-gallons and up), truck-refilled tanks. We can economically make these connections for you. A bench at a hot tub or cowboy tub is a necessity. We offer a number of designs. One of our favorites is a simple steel-and-wood model. There is nothing more practical — and beautiful (if correctly conceived) — than a concrete or paver patio. They provide a year-round surface that is not impacted by rain. They also are easy to clean and they minimize the tracking of dirt into your home. We convert stock tanks so that they have a rapid-fill capability and a quick-drain system. The idea is not to store water in them (as with a swimming pool or hot tub), thus avoiding the need to have them serviced. Instead they are drained after each use into underground perforated pipe that is installed adjacent to plants that can benefit from a little extra water. We have installed both round tanks (usually five or six feet in diameter) and smaller, oblong ones. If you have an idea for pretty much any custom steel thing — we can build it for you. Ask! One of the best — and least expensive — deterrents for keeping unwanted vehicles from entering a property are simple steel posts with a padlocked chain. They are unobtrusive and effective. Sometimes the only way to take in the fully majesty of our sprawling desert is to go up a little in elevation — to remove as many visual barriers as possible. At the same time there are those of us who think there is no more magical way to fall asleep other than under a blanket of stars. Our elevated observation / sleeping platforms are designed to meet both requirements. We build them with sturdy, site-welded tube steel frames and then add redwood or ipe decking. These platforms come with a major bonus — the elevated deck creates a naturally shaded lower area perfectly suited for a summer sun-protected second deck. Two decks for the price of one! There is nothing quite so sublime as sitting in front of a warm fire in the High Desert while stargazing on a cool evening. The easiest way to provide this experience to your guests is to offer a propane-fueled fire feature. One of the simplest ways to do this is to take a large, steel Chinese wok, add three short steel legs and a fire ring and — presto — an inexpensive fire feature that invites people to pull up chairs on all sides. We often install these with flexible hoses and quick-connect fittings so you can move it to accommodate other activities. We also offer more elaborate firefeatures, such as ones fashioned around a gabbion — a wire cage filled with rocks. Renters love any excuse to be outdoors in our High Desert environment. One of the least expensive things you can offer them as way of enticement is a horseshoe pit. We build them to regulation requirements so that your renters can experience authentic horseshoe matches with their friends. Hot tubs are at the top of the list of features that can demonstrably boost revenue at vacation rentals. We install all makes and models and we are expert at knowing the best places to install them to ensure the biggest “wow” factor. And we do it all — including installing concrete pads and providing the necessary wiring and plumbing. A problem with hot tubs is what do you do with the bulky lid when the tub is being used? If you have no solution for this problem, renters will simply toss the lid on the ground where it will inevitably get dirty and torn up (especially if the wind is blowing). Some manufacturers make a gizmo that allows you to retract the lid but often these retract in ways that interfere with views of the surrounding desert. We have created a design that eliminates this problem. It is a simple steel rack that allows the lid to be easily slid off and down from the tub. It does not interfere with views and it keeps the lid from being blown about by winds. A real, in-ground swimming poolis a rare thing inthe High Desert. One reason for that has to do with concerns about evaporation given the scarcity of water — as well as the fear of attracting critters. But improvements inautomatic pool covers have largely negated both issues. These pools do not need to be large. Even a pool as small as 10 feet by 15 feet can measurably add to your property’s rental value. Also, consider an in-pool spa. Including a heated spa with jets as part of your pool project saves money by allowing you to forgo a separate, free-standing hot tub. It also saves space since the pool and spa are integrated. Visitors to our area strongly prefer to rent properties that are clean — inside and outside. We have the equipment and know how to clean up even the junkiest properties. We are very mindful of the importance of limiting the amount of ambient light at any of our High Desert vacation rental properties. Preserving our dark skies for the enjoyment of local as well as out-of-town stargazers is vital to all of us. That’s why we design minimally invasive low-voltage landscape lighting systems. And we never design them to come on automatically at dusk. Instead you must turn them on when you want them (and a timer shuts them off automatically after a set amount of time). Anyone can run down to The Home Depot and buy some plants to stick in their yard. We think a special High Desert property deserves better. We love designing simple landscape schemes that utilize plant species that are native to our area. We find that these are appreciated by renters and that they stand up to our harsh conditions — often with no irrigation system required. Sometimes the only type of retaining wall that works aesthetically is a wall made from hand-set natural boulders. Let us look at your situation and provide you with a bid. Everyone remembers their first outdoor shower experience at summer camp. We find this to be one of the most popular amenities you can provide your guests. And they can be surprisingly inexpensive to install. We typically try to find a suitable spot just outside an existing bathroom for the ease of accessto both hot and cold water. Some properties have the luxury of having more than one patio or deck. And this offers the opportunity to designate one as the “winter” patio offering no shade and a “summer” patio with a permanent shade structure for maximum comfort in hot summer months. We design and build a variety of permanent patio covers. We use both steel and wood for framing and a number of materials for the top. One of the keys to operating a successful vacation rental is minimizing the visual and sound interaction between your property and neighboring properties. Most of us in the High Desert are not fans of property line fencing. We find that a few, carefully placed privacy screens may be all that’s needed to create privacy and to preserve the sense of the wide-open desert. Our typical privacy screen is fabricated from raw, corrugated steel sheets mounted to raw steel poles (each set in concrete). We like to then spray the steel with apple vinegar so that the steel quickly acquires a deep, natural-looking patina (and disappears into the surrounding landscape). Let us create a distinctive and durable “monument” sign for your home. It can include the property name or the street address — or both. In the High Desert, summers are plenty warm and winters cool. That poses a challenge for patios. In the summer, guests want ample shade so they can avoid direct sun. In the winter, they want all the sun they can find. We solve this dilemma by offering a variety of retractable shade structures, most often utilizing shade cloth materials. We are big believers in the importance of giving renters as pristine a desert experience as possible. That’s one of the reasons that whenever possible we help our clients group all of their utility apparatus behind a screen so renters only see a desert vista devoid of clutter. Among the equipment that we like to hide are the following: Wells, pumps, water tanks, propane tanks, fire sprinkler gear, satellite dishes, trash andrecycling bins, clotheslines, tool sheds, irrigation gear, electric meters and panels, solar gear, generators, telephone junction boxes, etc. Anyone using a hot tub or a cowboy tub will inevitably be looking for a place to hang their clothes and towels so they stay dry and clean. Our steel racks do just that. And they are attractive! Wood decks have an unmistakable warmth to them. They also allow unwanted dirt to fall off of shoes so they are easy to keep clean. Our desert is very harsh on most woods so we prefer to use products such as ipe, a sustainably harvested South American hardwood. It quickly acquires awonderful gray patina and it is nearly splinter free. We also design and install decks made from the now-common synthetic wood products (such as Trex). Whatever the material, your deck will have any number of potential uses — including star gazing (be sure to buy lie-flat loungers) and yoga.